Downton Abbey series 2 DVD includes Christmas Special and bonus disc. Rest assured DVDLand only sells Australian region 4 DVDs made for Australian DVD players. Julian Fellowes' hit drama Downton Abbey returns with all the regular cast including Dame Maggie Smith, Hugh Bonneville, Elizabeth McGovern, Brendan Coyle, Joanne Froggatt and Dan Stevens. Returning to Downton Abbey in 1916, we see the effects of The First World War on the lives of the Crawley family and the servants who work for them. The new series sees the return of all the much loved characters whose intertwined lives are rendered more complicated by wartime and its impact on the great house itself. And when the storms of war have finally cleared, will the way of life known by all the inhabitants of Downton have changed forever? excellent! compelling viewing. Series didn't last long enough and now cannot wait for next series. 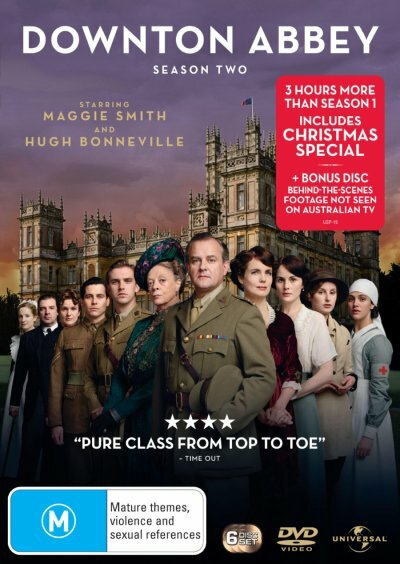 Click the button below to add the DOWNTON ABBEY - COMPLETE SERIES 2 to your wish list.